Ian Hutchinson with joint TAS Racing team owner Hector Neill at the Isle of Man TT this year. Sixteen-time Isle of Man TT winner Ian Hutchinson is on the verge of a sensational move to Honda Racing. Hutchinson has held talks with Honda as the Yorkshire rider appears set to leave Moneymore’s Tyco BMW team after two seasons. The 38-year-old is recovering from injury following a crash in the Senior TT in June, which ruled him out for the rest of the season. He claimed another two wins around the Mountain Course, winning the Superbike and Superstock races on the Tyco BMW machines to become the third most successful solo rider ever behind Joey Dunlop (26 victories) and John McGuinness (23). However, it now seems Hutchinson is pursuing a new challenge in 2018 and on Saturday, joint TAS Racing team owner Hector Neill admitted he was unable to confirm whether or not the Bingley Bullet would sign for a third year. Tyco BMW has officially confirmed Manxman Dan Kneen in the team, but it remains to be seen if the 30-year-old will be TAS Racing’s sole representative at the major international road races next year. Lee Johnston from Fermanagh has also been linked with a move to Honda Racing. Johnston has yet to confirm his plans as he aims to bounce back next season after a serious crash in practice at the TT thwarted his hopes. Honda endured a nightmare season on the roads in 2017 with the new Fireblade SP2 and will be out to put the crisis behind them. 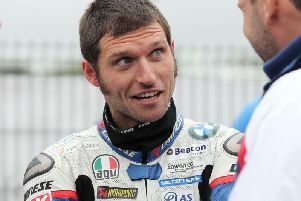 Guy Martin made his comeback amidst a blaze of publicity but the Lincolnshire rider cut a hugely frustrated figure, while Morecambe’s John McGuinness suffered a serious leg injury after crashing during at the North West 200 in May, ending his season. McGuinness felt his crash at Primrose Corner was caused when his new Honda failed to slow as he rolled off the throttle. Martin also experienced issues with the Fireblade and in an unprecedented move, Honda withdrew from the North West due to uncertainty over the cause of McGuinness’s accident. More drama followed at the TT, when Martin came off at high-speed on the opening lap of the Superbike race at Doran’s Bend, fortunately escaping injury. Honda later pulled out of the blue riband Senior race at the end of race week. Despite hopes that Martin would return on the Honda at the Southern 100 and Ulster Grand Prix, he was missing from both events and later announced that after a ‘disastrous’ year, he intended to focus on other challenges outside the sport.